TEAM. Together Everyone Achieves More. It’s a saying that is posted in many youth sports locker rooms around the country. And it’s no secret: the most successful teams in any sport are marked by great teamwork. History celebrates the great partnership between two players or the seemingly average group of individuals who work together as one to achieve extraordinary success. And when we think about one of the life lessons we hope our kids gain from playing youth sports, many parents say “teamwork” or “learning to be a good teammate” is at the top of their list. Teaching teamwork can happen both on and off the field. And it starts by helping kids understand what teamwork is, how to practice being a good teammate, and celebrating good sportsmanship among teammates. While the dictionary definition talks about a cooperative or coordinated effort in the interest of a common cause, most of us understand the meaning to be a group of people working towards a common goal while creating a positive environment that celebrates and accentuates each individual’s strengths to create a combined better performance. It’s the idea that the whole is greater than the sum of its parts. That together we are stronger than we are individually. Talk to your kids about what attributes make a team successful. Positivity. Trust. Supporting each other. Striving for excellence. Accepting responsibility. Providing encouragement. As an example, start with your athlete’s favorite team and make a list of all of the traits that make that team great. In no time you’ll have a long list of qualities that then become a tool for demonstrating how your child could be a great teammate. Talk! Great teams communicate with each other often, both on the field and from the bench. Brainstorm together. At practice, talk with teammates about how to help each other or what you can do together to improve. Be a good example. You don’t need to have the Captain’s C on your jersey to be an influential leader on your team. In fact, great players can inspire, encourage, and be great teammates even when they are on the sidelines. Teamwork isn’t just for sports. Incorporate it at home with projects that involve your athlete and their friends or siblings. Play board games as a family where you and your child are teammates. Stage a neighborhood play where everyone has a role – and as a team you’ll put on a terrific production. Last but not least, don’t forget to celebrate and praise good teamwork when you see it. “Great pass!” “Way to set your outside hitter!” Cheering and clapping for kids working together reinforces that behavior. Being a great teammate is just one of the many elements of good sportsmanship. 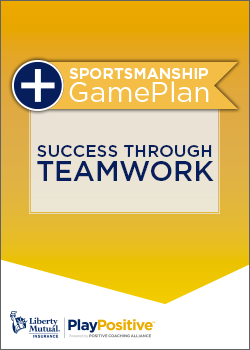 Stay tuned for next month’s article for more helpful tips to encourage good sportsmanship. The Liberty Mutual Insurance Play Positive™ program, powered by Positive Coaching Alliance, promotes good sportsmanship in youth sports so that our kids can have the fun and positive experience they deserve. We believe kids can learn valuable life lessons when coaches and parents come together to support doing the right thing on and off the ice. In an effort to benefit millions of youth athletes, parents and coaches, this article is among a series created exclusively for the Liberty Mutual Insurance Play Positive™ program, powered by Positive Coaching Alliance. ©2015 Liberty Mutual Insurance and Positive Coaching Alliance. All rights reserved. This material may not be distributed without express written permission. Any reproduction in whole or part by and individuals or organizations will be held liable for copyright infringement to the full extent of the law.